2. Now put your name and E-mail address on your letter to Santa. (IMPORTANT! Please double check your E-mail address. It must be exactly correct or Santa Claus can't reply to your message) AOL visitors, please be sure to put your full e-mail address, not just your name. For example, yourname@aol.com... not just your name. 3. Now pick out a stamp to go on your letter to Santa Claus. 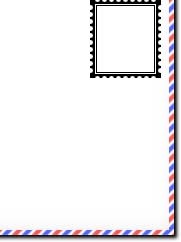 (By the way, after you send your e-mail,you can print big pictures of the stamps in color, or in black & white to color.